Coconut oil is fantastic, and olive oil richly deserves all its good press. But they’re not the only Paleo fat choices around! In fact, some of the best Paleo-friendly fats might be right under your nose: animal fats. Animal fat, of course, has a terrible reputation, but like all the rest of the low-fat myth, it’s completely undeserved. Fat, including saturated fat, from healthy pastured animals does not cause heart disease, cancer, high cholesterol, obesity or anything else. Chalk up one more point for traditional wisdom: the fats our grandparents and great-grandparents cooked with are good for us after all. When you have jars of olive or coconut oil available in every store, why would you want to go for something “weird” like tallow or schmaltz? It’s usually cheaper. Many farmers will literally give it away, because nobody wants it. With the rest of the world still terrified that looking sideways at a spoon of lard will give them heart disease, mass quantities of animal fat are yours for the taking, often for free or a trivial charge. It’s delicious. Soybean and canola oil aren’t just unhealthy; they’re also a crime against taste buds everywhere. The right fat will do wonders for your cooking, and make even ordinary dishes taste like amazing indulgences. There’s a reason why duck fat French fries are so legendary! Foodie culture lately has been all about rediscovering fat in various ways – and you can do it, too. It has health benefits. For example, here’s one paper where beef tallow increased the power of conjugated linoleic acid in fighting mammary tumors. This study is extremely interesting. A 10% beef tallow diet was carcinogenic, but when 1% conjugated linoleic acid was added, the diet became anti-carcinogenic. This may suggest that pasture-raised tallow (which naturally contains conjugated linoleic acid) is significantly more healthful than factory-farmed tallow. In this study, beef tallow helped subjects absorb Vitamin A better than sunflower oil. In this study, feeding either lard or tallow to alcoholic rats reduced liver damage dramatically compared to corn oil. It’s hard to find studies in human subjects, or studies where animal fats were given without massive doses of soy or corn oil alongside, but the data we do have is encouraging. Convinced to give animal fat a try? Here’s how to get started. Before using any animal fat to cook with, it has to be rendered. This is simply a process of heating the fat so that it melts and any impurities float to the top. Lard is the fat from a pig; both the raw and the rendered fat are called lard. Raw fat: will be white to pale pink. It may have scraps of meat, connective tissue, or skin clinging to it (hey, you’re buying a part of something that was once alive; it’s not going to look 100% perfect all the time). Rendered fat: should be pure white to very pale warm cream color. It’s solid at room temperature, but soft – around the consistency of butter. How to cook it: lard is irresistible melted on top of a baked sweet potato (as a replacement for butter), or use it to cook any pork dish for extra flavor. Suet or tallow is the fat from a cow. Suet is the raw fat; tallow is the rendered fat. 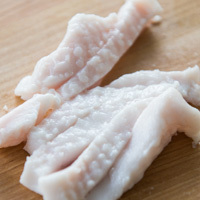 Raw fat: will be white to pale yellow, crumbly, and very light for its size. It may have scraps of meat, connective tissue, or skin clinging to it. Rendered fat: should be white to cream-colored. Because it’s highly saturated, it’s hard and brittle at room temperature. You can’t scoop it, and to cut it you’ll need a sharp knife. If this is a pain in the neck, you can pour your rendered tallow into an ice cube mold while it’s still hot and liquid; it will solidify in the cubes and you can pop them out to cook with one at a time. How to cook it: tallow is one of the most stable cooking fats this side of coconut oil. Because it has a relatively high amount of saturated and a relatively low amount of polyunsaturated fat, it’s ideal for high-heat cooking. It has a very mild beef flavor, and it’s tasty with almost any kind of vegetables or eggs. Both the raw and the rendered fat are simply called “duck fat,” although rendered is much more common to find in stores. Raw fat: typically comes attached to a duck. Should be white to pale yellow or pink. Feels soft and slightly greasy. Rendered fat: solid but soft at room temperature, around the consistency of butter. Should be a creamy white. How to cook it: Duck fat is the Cadillac of animal fats – it’s so decadent you almost want to eat it straight from the spoon. Try roasting parsnips or other starchy root vegetables in it for a delicious treat. Alternately, try a confit. You’ll almost never find raw chicken fat, unless you pull all the fat and skin off a chicken yourself and render it (which you can absolutely do!). Typically it’s sold rendered. 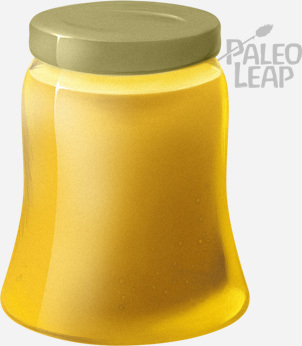 Rendered schmaltz should be a pale to medium yellow color. Because it has more polyunsaturated fat than other animal fats, it’s just barely solid at room temperature, ready to liquefy at the slightest heat. How to cook it: Schmaltz is best-known for its starring role in traditional Jewish cuisine. It has a lighter flavor than duck fat; it’s wonderful for roasting potatoes, frying onions, making chicken soup, or frying up any other chicken recipe you’re working with – it intensifies the chicken flavor and adds a lovely depth to the recipe. Animal fat is healthy, delicious, and extremely economical. It just doesn’t make sense to butcher a cow, throw out huge chunks of perfectly good fat, and then buy more cooking fat to brown your meat with! And animal fat is also delicious in a way “vegetable oil” just can’t match – try it once, and you’ll never go back to tasteless junk fat again. You can buy raw fat from most small farmers (or sometimes they’ll just give it away, if you ask nicely). Or look in the freezer section of the grocery store – you might be able to find duck or chicken fat, or maybe even lard. Happy eating!